John obtained his Bachelor of Music from the University of Auckland during which he studied with James Fry, Associate Principal Clarinet of the Auckland Philharmonia Orchestra. 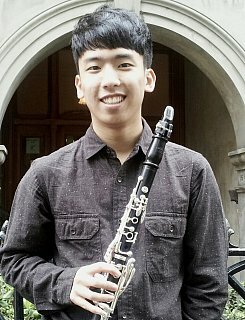 He has also participated in masterclasses given by renowned clarinettists such as Dimitri Ashkenazy and Julian Bliss. John was the Principal Clarinet of the University of Auckland Symphony Orchestra and also a casual member of the Auckland Youth Orchestra playing the bass clarinet. His chamber music performance at the NZCT Chamber Music Contest national finals held in Wellington was broadcasted live on Radio NZ Concert. With almost 10 years of teaching experience, John has developed a passion for nurturing the artistic potential unique to each student. He has taught clarinet and saxophone both privately and at secondary schools. His students have thrived in school ensembles and grade examinations. Additionally, John has taught multiple ethnomusicology papers at the University of Auckland as a course tutor. John recently graduated with Master of Arts from the University of Auckland specialising in ethnomusicology which he began with particular interests in anthropological theories and world music cultures. He has presented about Korean and Japanese music at international academic conferences.